Arrowwood with its classical opposite buds. If it weren’t for the fact that the leaves are gone, we might not even notice it was winter. And, indeed, the Multiflora Rose and Honeysuckle have been tentatively leafing out in order to ‘test the waters’. So, in part to emphasize that it is indeed winter and in part to satisfy frustrated botanists, we offer this little blog on winter botany. This parallels a short course we just gave on the topic, but I’ve thrown in a couple of non-botanical sightings as well. While one can usually make a pretty good guess at the identification of a woody plant from its buds and this blog will focus on buds, there is no good reason to confine your collection of evidence to bud characteristics – look at the bark (see this book for a fun guide to bark), the shape of the tree, the leaves on the ground, the fruits still on the plant, etc. Sometimes, a puzzling bud can easily be solved by looking for some of these ‘accessory’ clues. For those of you who want to cut to the quick, I’ve posted our ‘Woody Plants in Winter’ key and photo guide here; it includes all the bud photos included in this blog and some additional ones. One place to start when trying to ID a leafless woody plant is asking whether the side buds are “opposite” or “alternate”. These terms refer to how the side buds (and hence leaves and branches) are organized: are they directly opposite each other, as shown in the above photograph or are they offset, rather like the ladder of stakes that telephone companies used to put in their poles? 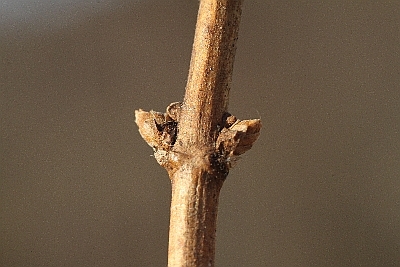 The side buds on this Willow are "alternate", meaning that they are offset from each other. The majority of woody plants that you’ll probably run into are ‘alternate’. That means that when you find a twig with opposite buds, your detective work has just gotten easier. The classic, if flawed, mental aid for remembering which woodies are opposite is MADog – in other words, Maple, Ash, and Dogwood are the groups of common species which have opposite buds (see below). These are the distinctly opposite buds of Norway Maple, a somewhat invasive Maple species in our area. 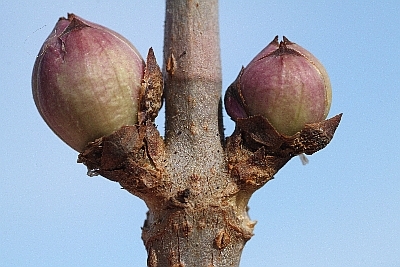 This species has relatively big buds and so is good for illustrative purposes. 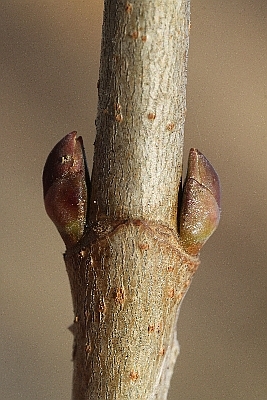 The paired, opposite side buds below the end bud of this White Ash are clear. 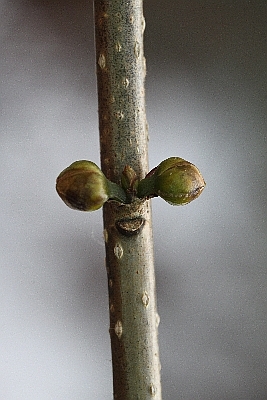 This terminal bud of Flowering Dogwood betrays its 'oppositeness' by the symmetrical bumps at the base of the end bud - these were the bases of two opposite leaves. So far, so good, and the truth is that these probably are our most common opposite woodies, however, the first image of this blog already introduced you to one other large set of opposite shrubs and small trees: the Viburnums (which include Nannyberry, Arrowwood and a few others). These clearly have opposite budding and leafing, and are probably most often confused with Maples, although they never reach the size of most Maples. We have a few other opposite-leafed plants including the frequently-escaping Honeysuckles and Elderberry. Elderberry doesn't always boast such prominent flower buds, but it is always opposite. 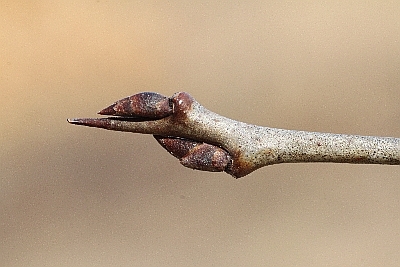 Honeysuckle's buds tend to be more modest, but they too are clearly opposite and, at least where Honeysuckle has become invasive, these shrubs are common. Finally, Buckthorn throws a wrench into things by being sometimes opposite. Our most common local species is the somewhat invasive European Buckthorn whose scientific name, Rhamnus cathartica, apparently describes the gastric consequences of eating its fruit. Having racked my brain (or at least paused to think about it), the best new mnemonic I can come up with is “Mad dogs vibrate, eat Elderberry Honey, and sometimes puke.”, with the last word meant to conjure up ‘cathartica’; alternatives are very welcome… err, very needed. 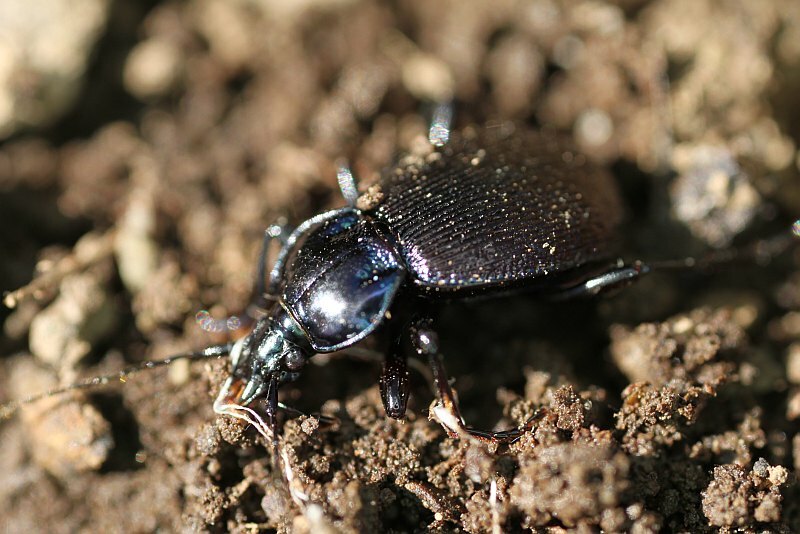 Speaking of wildlife (mad dogs), these beetles, Sphaeroderus stenostomus - Woodland Snail Eaters, are out and about. During the first week of February, I found a pair mating by the edge of a sunny rock. I wonder if they usually mate under the snow (and I don't see them) or if the warm weather has advanced their habits? As one gets into the alternate-leafed plants, there are a couple of short cuts that let you split up the pack. First, ‘scratch and sniff’ can be useful. Yellow and Black Birch, for example, have a usually distinct, sweet, root beer’ish smell. 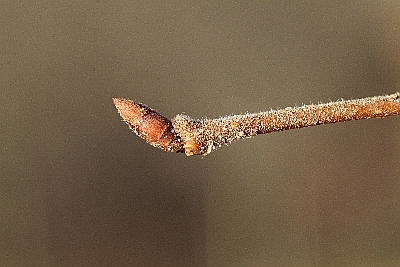 If your computer is not equipped with a 'scratch and sniff" monitor, then the best you can do look at this picture of a birch bud while drinking root beer. 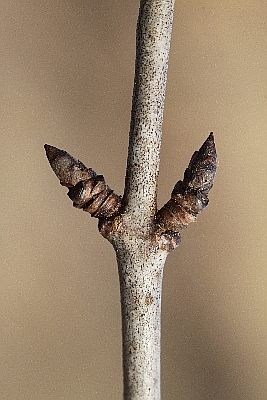 Spur shoots like this or longer are typical of many birch. The twigs tend to be thin and flexible. To me, Sassafras has one of the most pleasant smells; it’s sometimes nice to carry a Sassafras (or Birch) twig in your pocket for low periods. Sassafras is near the north end of its distribution here, and it tends to be a twisted, scraggly tree (although I have seen local exceptions). Rumor has it that it gets substantially bigger farther south. Sassafras, the greenish twigs are typical and seem to be brittle - one frequently finds twigs on the ground. It smells as good as it looks or better. On the less pleasing side, cherries have a characteristic smell that some describe as ‘medicinal’ or ‘bitter almond’; it’s a bit like the taste you get from accidentally biting into an apple seed (and perhaps for the same reason – the cyanic acid that both contain). Chokecherry tends to be a shrub in our area. It has small, two-toned buds. 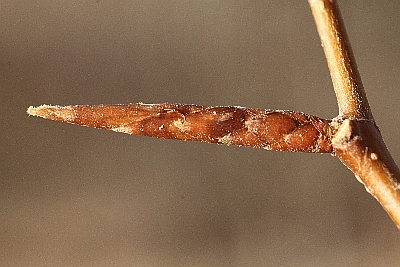 Its twigs share the bitter-almond smell with our other cherry species and, also like those other cherries, it is regularly afflicted by Black Knot, a fungus that causes knobbly black growths on twigs. The scent of our final ‘nose teaser’ is something of a cross between cherry and Sassafras – Spicebush, like Sassafras, is in the Laurel family and so has some sweet overtones to its smell; however, it can be quite strong and seems appropriate for delivery in a teaspoon for what ails you. 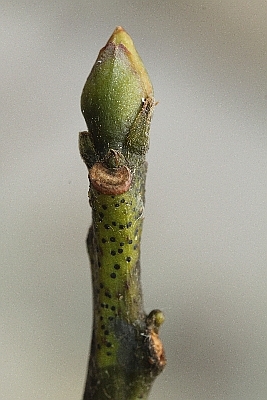 The greenish tinge and paired flower buds of this twig are typical Spicebush. Just to make sure the insects don't lose out entirely, here's what's probably a Capniidae or 'Small Winter Stonefly'. Gathering fish tank water from the creek these days, I often have trouble not scooping up small stonefly larvae which are out and about. Apparently, these winter stoneflies pass summer 'hibernating' on the stream bottom and only become active as temperatures drop during the autumn. Some time during midwinter, they leave the water as adults. Apparently the females do feed on the rare greenery of lichens, mosses, and/or blue-green algae. Back to twigs. Another clue that will help you cut away a group of alternate-leafed woody plants is whether or not they have ‘clustered end buds’. 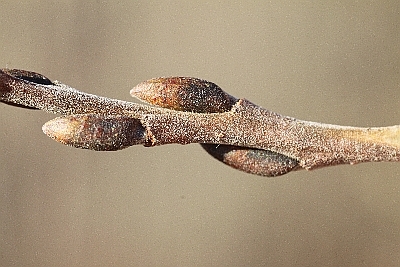 The buds of oaks tend to get bunched near the end of the twig as if somebody had taken their finger and run it up the twig, thereby carrying all the buds to the end. 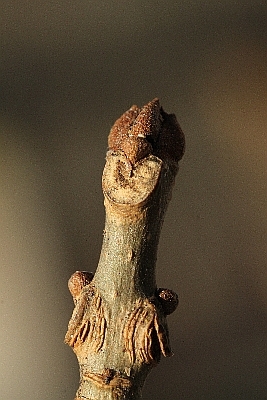 Actually, side buds remain, but a quick look up into an oak will usually show you a distinct branch silhouette caused by this twig-tip bud gathering. 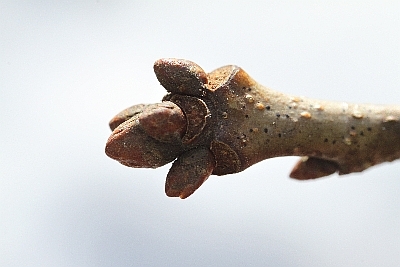 This oak twig tip shows the distinctive cluster of buds. 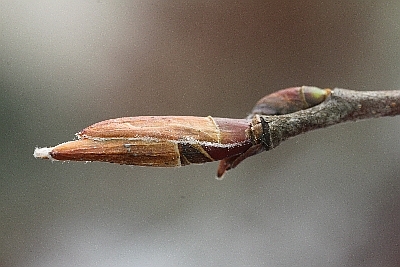 One possible source of confusion are the flower buds of Red Maple; in this season, Red Maple has already prepared its flower buds for the spring and they can be bulbous. 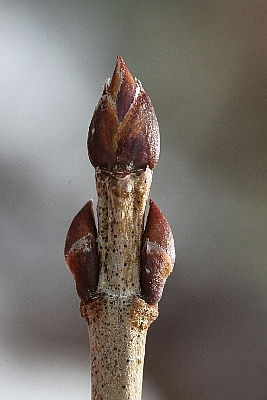 However, those flower buds will be scattered all along the twigs, not just at the tip; and we've already pointed out the important distinction that oak are alternate and maples opposite. Different oak species vary in the color, hairiness and size of their buds, but that’s beyond the scope of this blog (and, often, of my knowledge!). Having carefully carved away those possibilities one is left with an ‘odds ‘n ends’ assortment of plants that can be identified by various specific traits of bud, bark, etc. I’ll round out this blog by just illustrating a few of these intriguing stragglers. 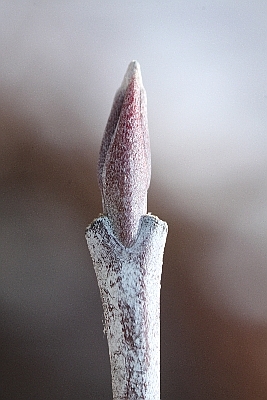 Serviceberry (also known as Shadblow or Shadbush or Juneberry) have what I call 'goosehead' buds; held in the way shown above, I can imagine the beak and 'forehead' of a goose... I've yet to convince my wife of this analogy. 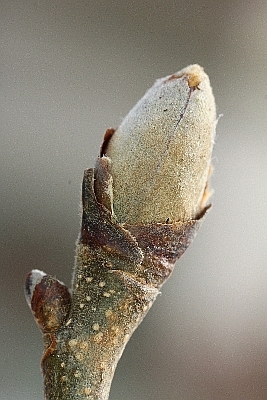 Bitternut Hickory has distinctive sulfur-yellow, granular buds. Since I don't find the sulfur smell/taste sometimes present in our tap water very appetizing, it's easy for me to remember that yellow means bitter(nut). Beech. Clearly a gnome cigar, need I say more? The bud of Shagbark Hickory is worth including here because hickory are so common in our 'oak-hickory' forests. 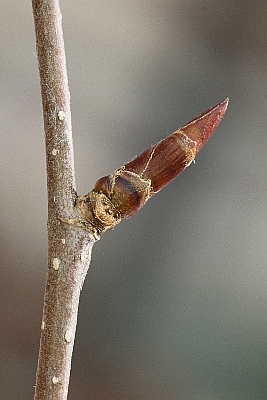 The difference between Shagbark and Pignut Hickory buds is mainly one of scale with the former being distinctly larger; however a quick look at the bark (shaggy in Shagbark, tighter in Pignut) and nut husk (thicker in Shagbark, thinner in Pignut) should help you distinguish these two 'on the hoof'. 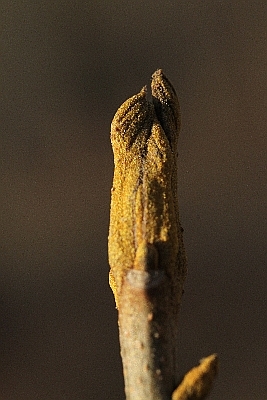 Our last alternate-leafed bud of this collection is Elm. The end but of Elm almost always has this distinctive 'snubbed' appearance as if it had run into something. Looking up at a tree with binoculars (always an important tree ID'ing tool) can often reveal this profile. 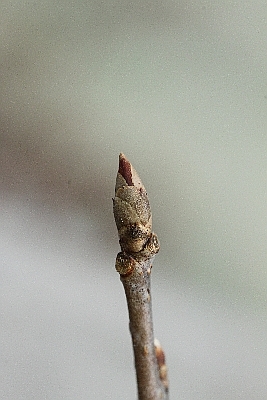 In winter, some Elm are already loaded with flower buds, so don't be surprised to see some bulging side buds on the twigs. Perhaps this little survey of buds has helped stimulate you to get out and do a little winter botanizing. Check out the guide that I linked to at the top of the blog, it includes reference to a trio of books that we find most useful. Don’t hesitate to send us pictures of twigs you want help identifying. Good-luck! I’ll let the arthropods sign off…. 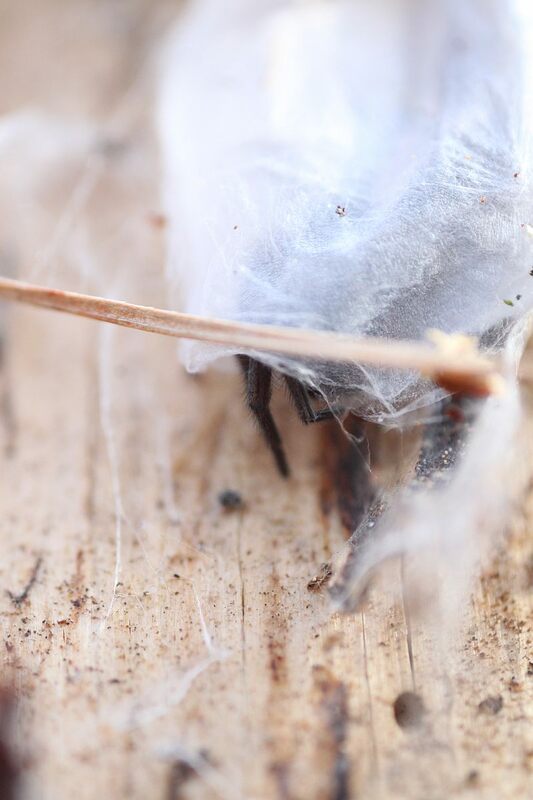 Until I disturbed it, this spider was tucked away for the winter in its silk nest below some tree bark. 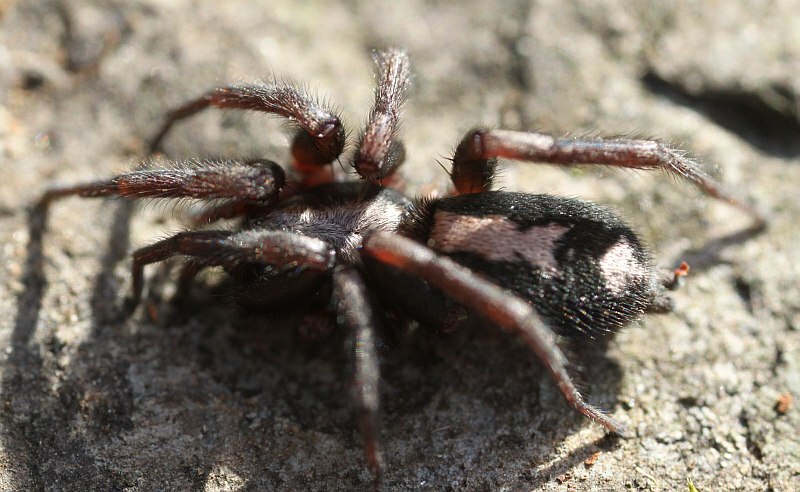 It was a Parson Spider, apparently so named for the cravat-like markings on its abdomen, and a fitting image to end this bout of Sunday blog writing with.